If I was good at waxing poetic, which I'm not, I'd be too fed up to do it, and this coming from a one time downhill skier. Enough already. Sue, if you're reading this, we're in sync! I went early to the hospital for the Holter monitor this morning, met some quilting friends for tea, and then picked up prescriptions and groceries before the storm. 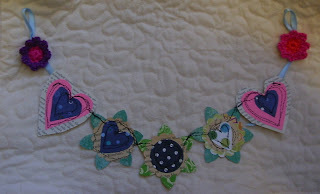 After a quick egg salad sandwich for lunch (this is comfort food for me), I headed into my sewing studio. This quilt was laying over the ironing board along with the final borders. I put those on and ironed it for a quick picture. My design wall is not big enough to completely stretch it out, but you can see most of it. 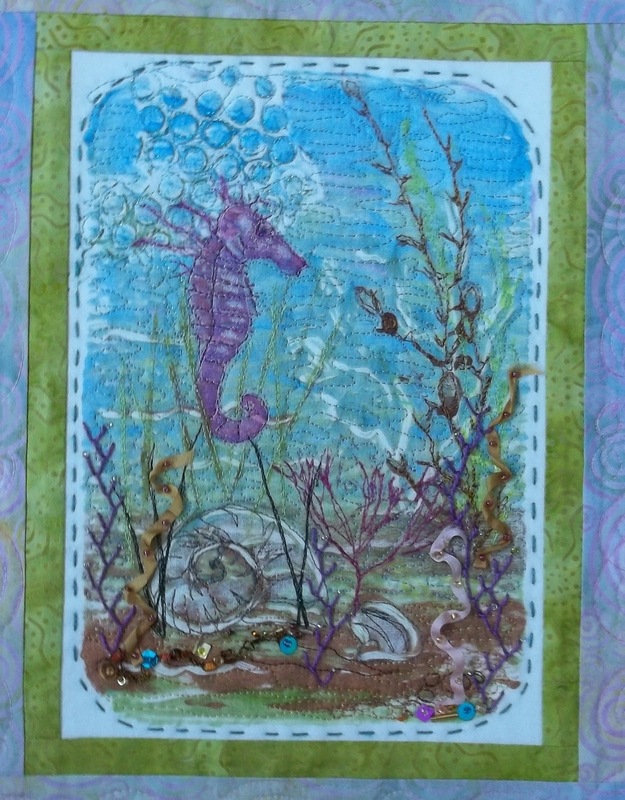 I'm not sure the gold color is wonderful in the borders, but the other colors were too difficult to match. 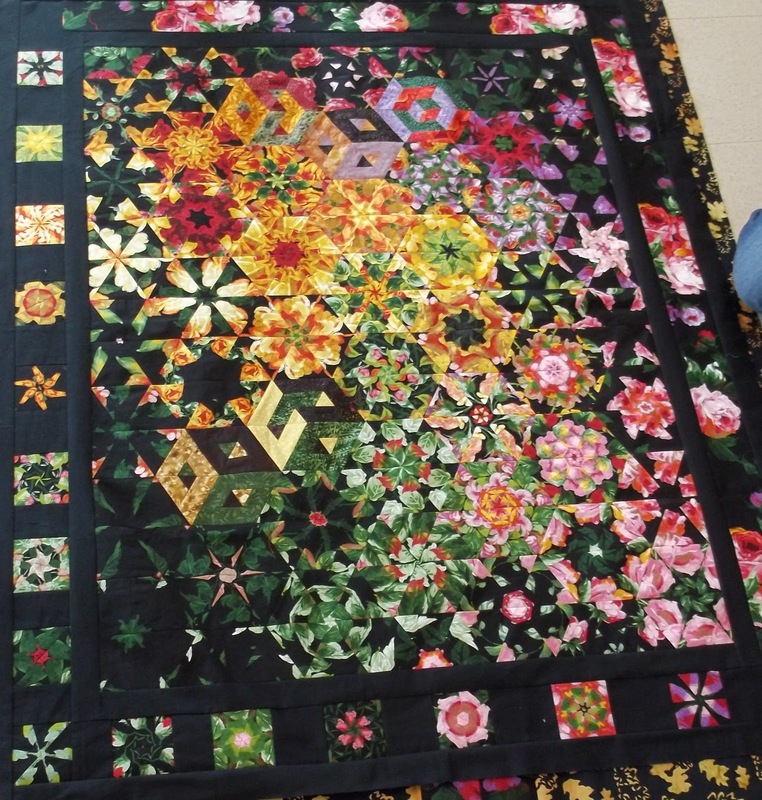 It is a fairly quiet quilt. 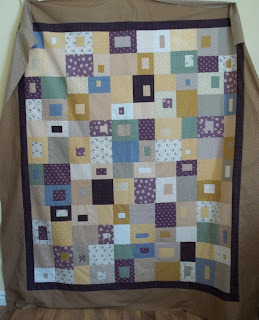 I will put it away until I can send it out for quilting. It is a little too big for me to tackle on my regular machine, I think. I sewed a few more cobblestone blocks and then cut a few more for the next time. I like to leave a few pieces on my sewing machine in case the mood hits when I have only a smidgen of time. I'm anxious to get back to my little applique birds, but I have to make myself take a break now. I will go sit and pick up my knitting for a while before dinner time. On Valentine's Day Gord took the day off and we planned to go snowshoeing and then lunch. 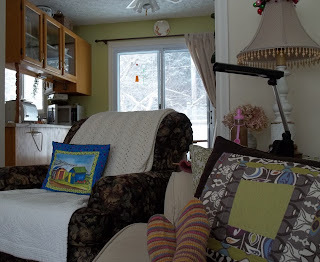 That was when I was just getting sick and we also got a big snowstorm, so we spent the day at home--me curled up sick on the sofa, my husband clearing snow. Yesterday, we had plans to drive the 2 1/2 hours to Moncton for a little shopping and to meet my son and his partner. Illness (this time my son) and the weather conspired again and we canceled. We'll rebook for sometime in a few weeks. So, we spent yesterday as we would have spent Valentine's Day. We went for lunch, did a few errands and spent some time together. It was a lovely day. 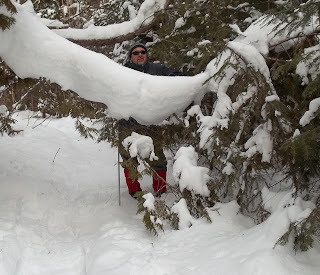 Today was my first day out snowshoeing since I had pneumonia. It was beautiful. 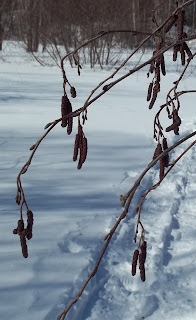 I did not hand feed the birds as it was very cold, but I did stop to take a few pictures of winter branches. I'm collecting models to use on my bird applique that I'm working on. 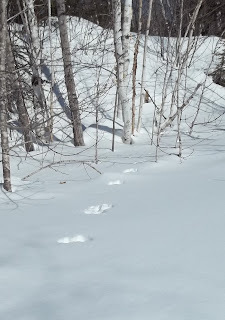 We often see lots of animal tracks--deer, fox and rabbit. 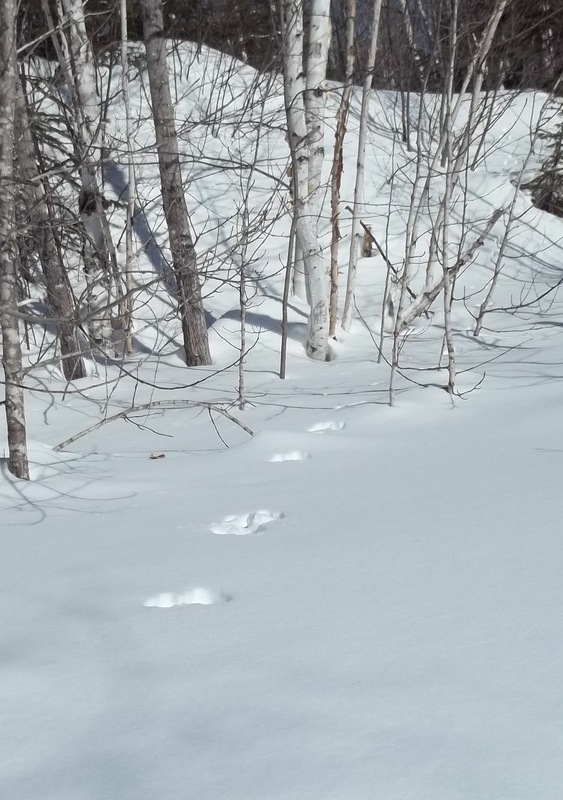 These are rabbit tracks. It quite amazed me that at one point there was about 8 to 10 feet in between the hops. I just purchased this little 'monster' friend from my friend Nicole who uses all recycled fabrics in her work. I've named her Clarissa. Nicole visited me last week with 2 baskets full of these funny creatures. I couldn't resist! Aren't they amazing! It's a beautiful sparkling sunny day today, but still chilly. We are still in the midst of winter--expecting more snow tomorrow. 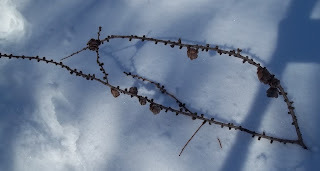 I am so jealous when I read all the blogs that are picturing the beginnings of spring in their areas. It will be some time before I'll be able to see the first shoots of early spring green poking up in my gardens. It will likely be early May. Oh well, on the bright side there is time for lots more snow shoeing! I just have to get my chest cleared out so I can get going again. It's a slow process, but each day is a little better. It's kind of a 2 steps forward, 1 step back kind of process. I thought it would be fun to show you the identical view out my back door that I showed before. 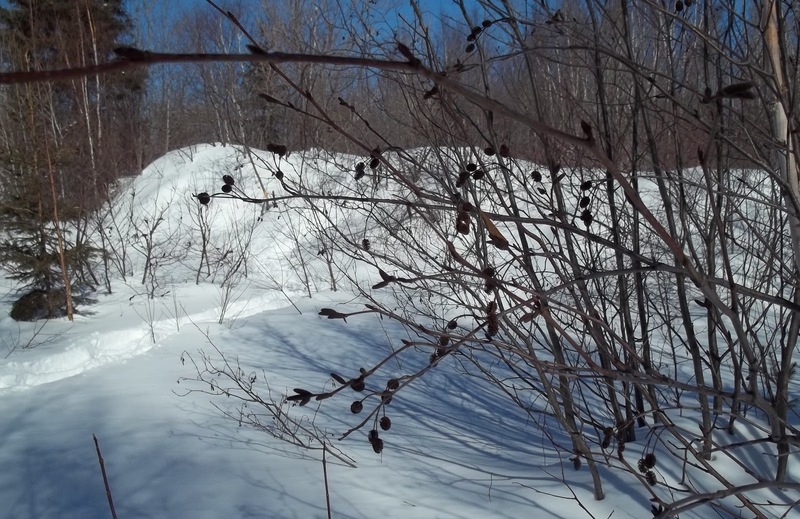 You can see the how our snow bank is growing. I've slowly been adding to my cobblestone blocks. They've grown to 16. I am being quite random with the fabric. 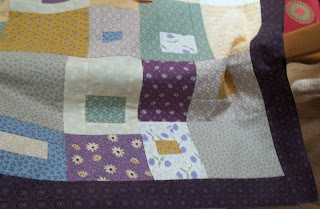 I had a jelly roll plus some fat quarters to use and I'm just throwing it all in there. It's pretty wild. I'm still having to take quite long rest periods in the day and some days I don't do much. I did a sample little bird the day before yesterday, and I'm itching to get back to it. I'm not satisfied with the color choice . 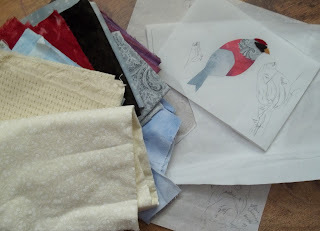 I have re-chosen some fabrics but haven't had the time to put them together. Today I may go get a few groceries if I feel up to it and that may be all I'll do. I knew this about myself, but I have just come to accept it again. I simply cannot string piece unless perhaps in retreat circumstances where some 'no brainer' work might be best. I can knit and get into the rhythm of that and often don't need even the TV. 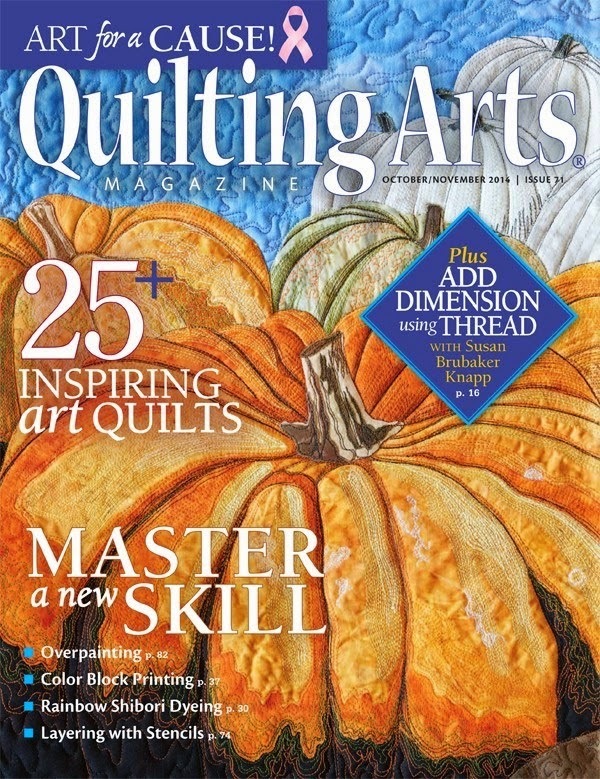 I've heard some say they enjoy the rhythm of string piecing and the hum of the machine but it is most often work for me. When I started blogging, I really didn't think anyone but a few friends would be reading it. I thought it would be a wonderful way to keep a journal with pictures that I could look back to. Recently, I've realized that I do have some readers and so, I started to feel a little pressure about what I get done. My interests are diverse and from the beginning I have written that I want my blog to be more about the process than the finished product, so I reminded myself about that this week with my new project. The most efficient method would be to cut all the pieces and to sit and string piece, but I just can't work that way. 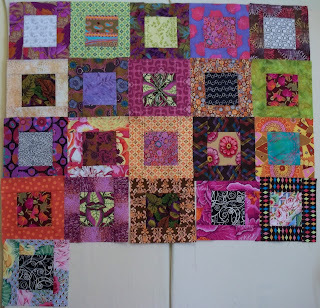 I like to ponder over the colors, cut several blocks, sew them, and put them up to admire. Maybe I'll pull a few more fabrics together for next time. Then I might switch tracks to something completely different. It's probably the ADD. 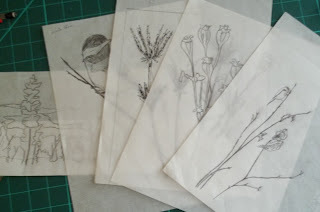 I'll take a break and then after lunch I'll switch to some sketching. Today, I did some loose sketches of red polls with color notes, transferred some to tracing paper, and then went rooting for some fabrics. I'm tired now and will stop to rest and read for a while before dinner. My energy is much better that last week, and I am definitely better, but I'm still congested. What I've been doing is putting heat on the pain, breathing in steam from hot water with essential oils of eucalyptus and tea tree oil. It seems to loosen things up . Then I use the puffers. 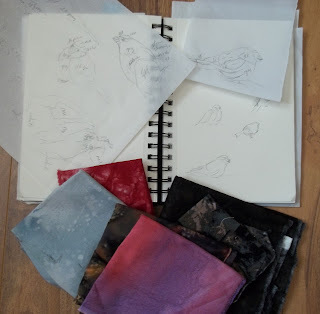 Perhaps, tomorrow I will trace some of the birds onto the fusible web and try a few on some background colors. I can get quite absorbed in that process. Since I'm still not quite up to getting out, I took a picture from my back door that may give you some idea as to how much snow we have. I heard we are to expect more perhaps Tuesday. 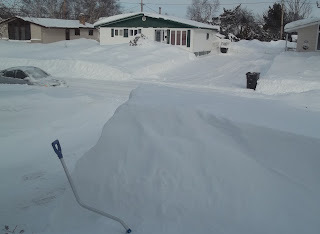 My poor husband doesn't have to decide what kind of exercise he's going to do--he's been snow blowing and scooping snow off the roof all weekend! 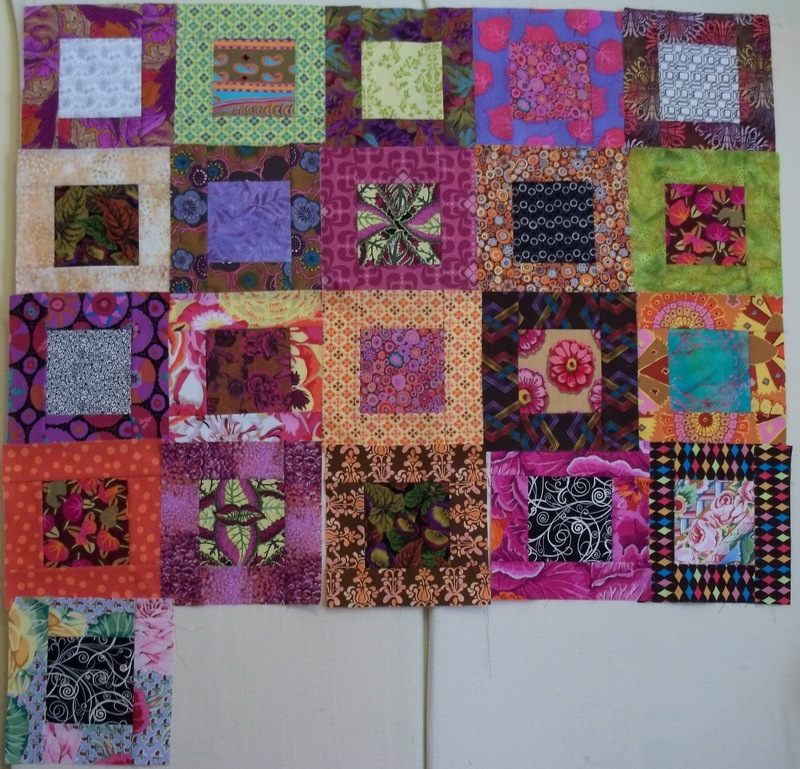 I've been in a bit of a slump lately, both health wise and quilting wise. Actually, I think one affects the other. 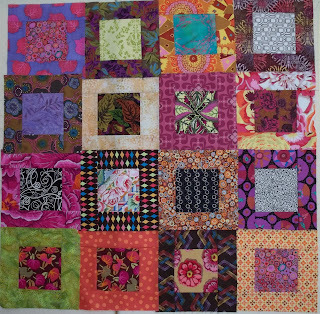 In my closet of fabrics I have a box where I've been collecting some Kaffe Fassett fabrics which I've been dreaming of using. 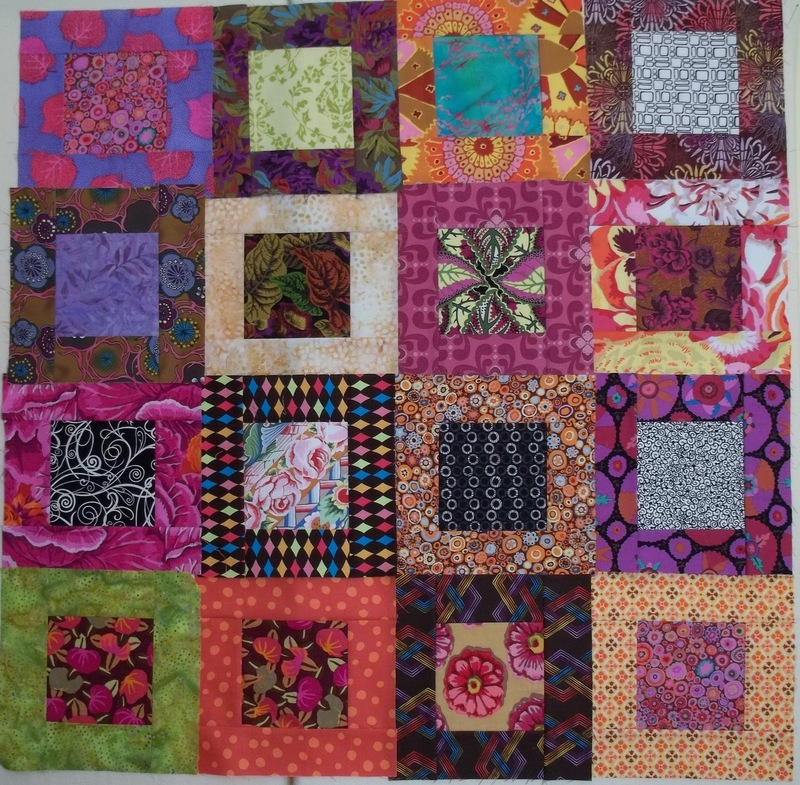 I have several fat quarters plus a jelly roll. The problem I've been having is to to find a pattern in which I could incorporate both. This is where the kindness of a fellow blogger comes in. 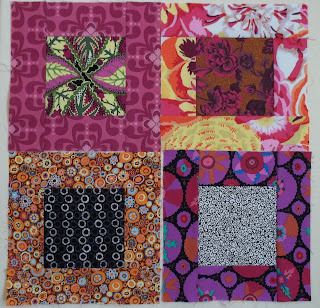 When I wrote to Wanda Hanson at Exuberant Color and told her about my ideas for a quilt, she made some suggestions. We wrote back and forth for a bit and then she worked out the measurements for me. I then wrote that I liked the ideas but couldn't picture it, and I was too tired due to the pneumonia to try anything yet. So, what does she do but whips up some blocks and sends me a picture. After that I decided what I wanted to do but wasn't sure if my fabric would work or not, so then she sent a link to another quilt. I went to bed and thought some more. By the time I woke up this morning, walked into my sewing room, and looked at the explosion of fabric that I had left out on my cutting table, I had made my decision. Today, I seem to finally have a little more energy, although my chest is clearing slowly. 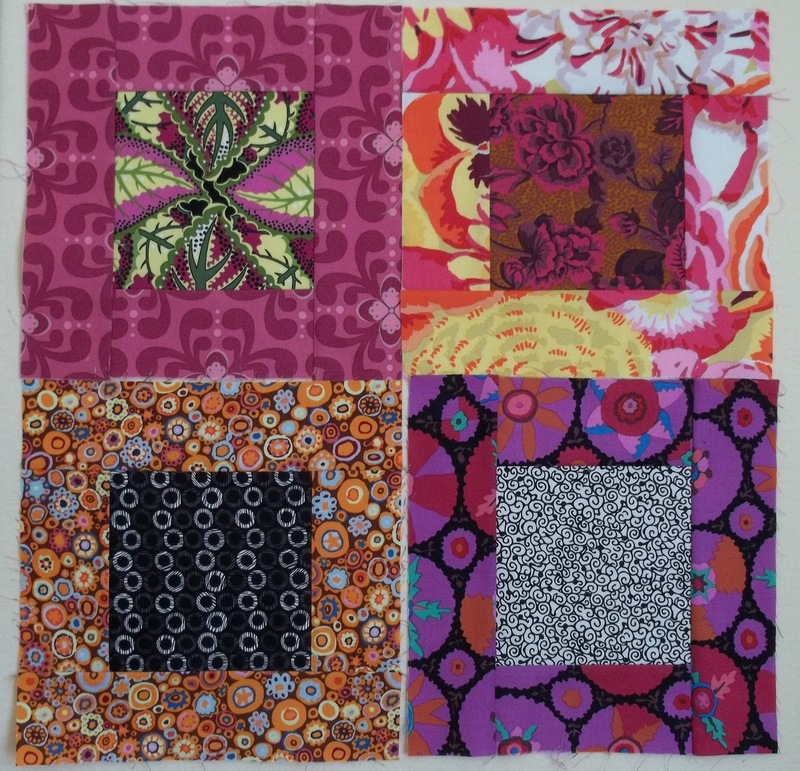 I cut and sewed these 4 blocks to see how it will look. I'm very happy and excited about them! It feels good to have that spark again. My thanks to a fellow blogger for helping along. Isn't blog land something? I'm still too weak to stand for long, so I wont' be able to do a lot of cutting, but it is very satisfying to have made the decision. Now I can start organizing and cutting . I am also knitting a sweater called The Tea Leaves Cardigan which I found on Ravelry. It is knit from the top down-- a new and wonderful method that I've just discovered. The yarn is a very nice double knitting weight cotton. It's called Buttterfly by Kertzer, made in Greece and such a gorgeous color! I did end up in emergency on Wednesday with a fever and a full chest. The doctor said it may be pneumonia or it may be the flu. They took a swab to test for H1N1 but since it takes two weeks, they're treating me for both. When this started, I followed the advise of the new endocrinologist and I only increased my cortisone by 1 1/2 times which turned out to be not nearly enough. The specialist at the hospital told me to take 2 to 3 times my normal dose until I'm better. I've doubled it but if I don't improve by tomorrow I may have to take more. Whatever it is, I'm very fatigued and lethargic. I'm discovering all the daytime TV shows. This was my position for most of today. 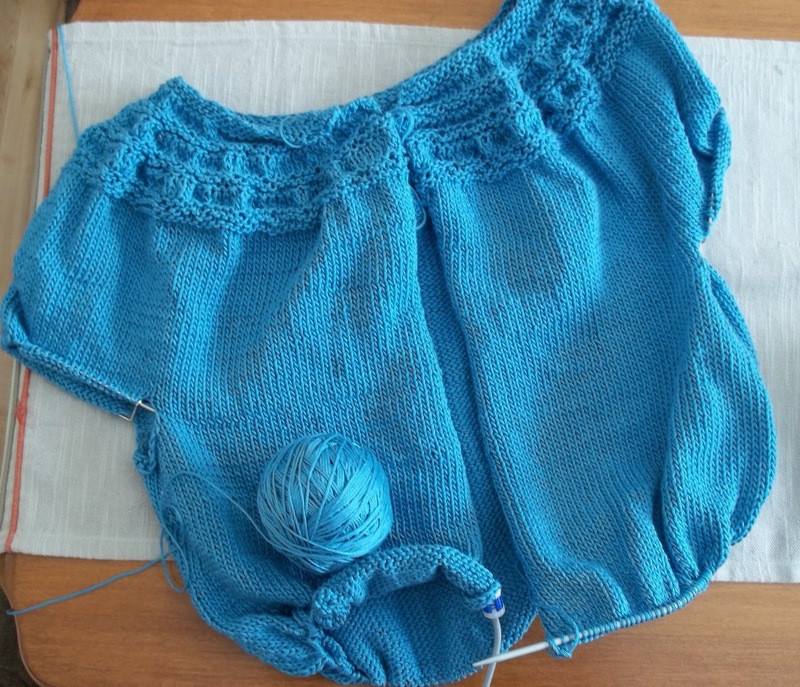 I did manage to hand sew the binding on the small hanging, and I knit exactly 2 rounds on my socks. Whew, It tired me out! I do feel some satisfaction that I finished one little thing though. Here is a little more detail. 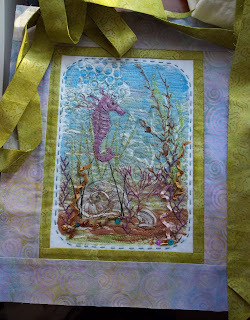 I started with a gel print, then a hand made stamp (seahorse), some stamping with real pressed seaweed, some thread painting, free motion quilting, perle cotton embroidery, and ribbon embroidery. I love doing these. 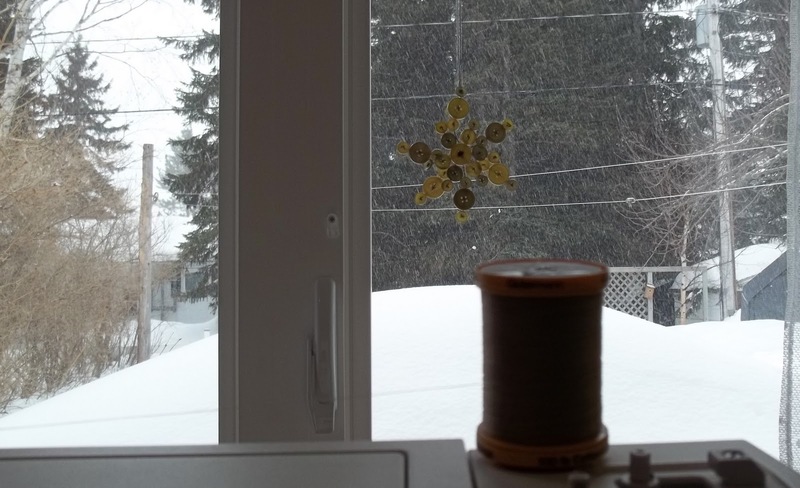 I'm not sure if you can see the snow coming down outside the window in the following picture.Earlier this week we got 25cm. We're getting it again today and tomorrow and supposedly another one coming on Tuesday. 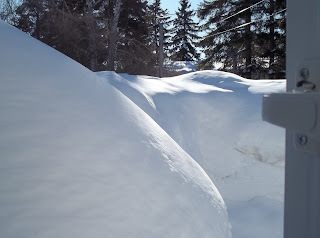 The snow blower can't blow it up over the banks they're getting so high. Gord was just on the roof last night clearing off the last dump.When I was skiing I prayed for this. It's all about the timing. These little red polls are fast becoming one of my favorite little birds to watch. They do not flit around as much as the chickadees, so one is able to get more photos. 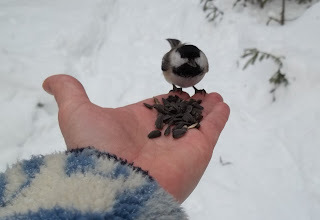 I don't think they'll feed from the hands though. 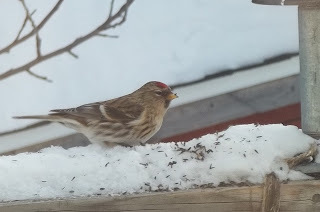 The males have a very pretty rosy chest. On Sunday, I felt better when I got up. It was beautiful outside too. G and I spent the day relaxing and visiting his parents. I pulled out a small hanging I did last summer and I put the finishing bits of embroidery on it. I summoned enough energy to cut and sew a binding together as well. I thought I was on the mend but by Sunday night my throat started getting sore. Now, it's in my chest. This little hanging is promised to a friend. Once I get back on my feet I will finish the free motion stitching in the border and sew the binding on. If I don't write for a few days it will be because I'm huddled under my afghan. I don't know if you can see it in enough detail. 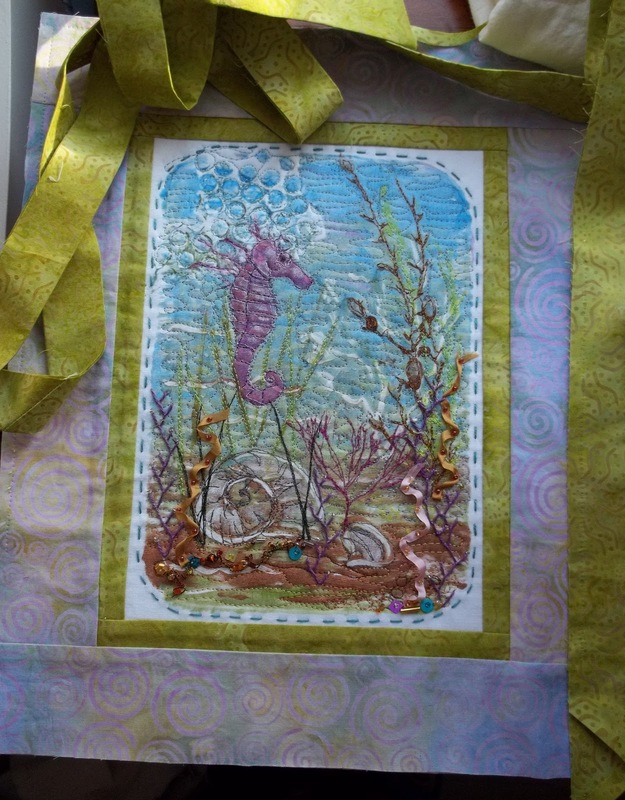 There are a lot of layers of stamping, sewing, and hand embellishing. Yesterday, Gord took the day off for Valentine's day and I was too miserable to do anything. To be fair though, it was good for him to have a long weekend, as it is long time from New Year's to Easter in April. We were going to go either to the pool or snowshoeing and then go for lunch. We'll have lots of other chances to do that though. I spent my day laying around. Also, we had another snowstorm yesterday and it's still pretty gusty out there today. Here is what it looked like out my front window a few minutes ago. 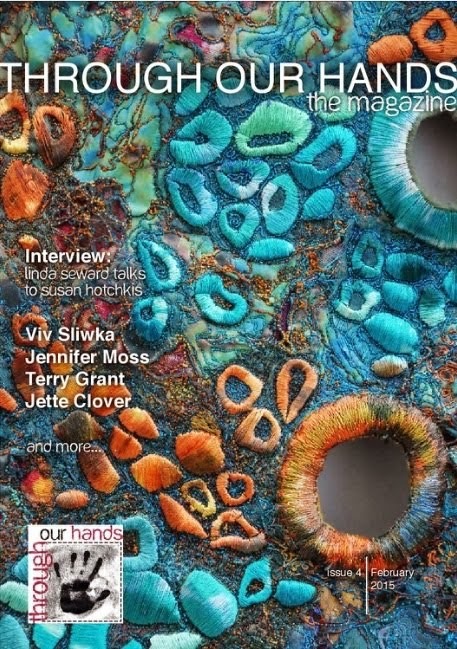 I have nothing quilty, sketchy or knit-wise to show. I can only offer more excuses and say that I haven't forgotten my blog; I'm just living in a very misty world right now. I have a blood test to check my thyroid levels again in 2 weeks and an appointment 2 weeks after that. In the meantime it's a test of my patience. Really, I know I should be glad I don't have something far worse as so many seem to around me. It's the lethargy and fatigue that is so hard. I'm no good at lying around and watching TV, or reading or knitting all day, but I seem to be coming to that lately. I haven't touched the sewing machine in days. It has been a busy week though. I just seem to keep getting infections and I'm just so exhausted. Today, my husband drove me to my hair appointment. I was so woozy and fatigued I was afraid to drive. It felt good to get a nice haircut though. When I got home, I had a soak (haircuts itch me all day) and got back into my pajamas. 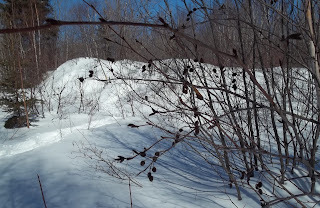 It was nice out today --finally milder--so I dragged myself out on the snowshoes with my husband. I just couldn't lie around all day and I hoped the fresh air would help. A little meeting with my friends was good too! It's an awful thing to feel this drained. I want to do things, but my body just won't cooperate. 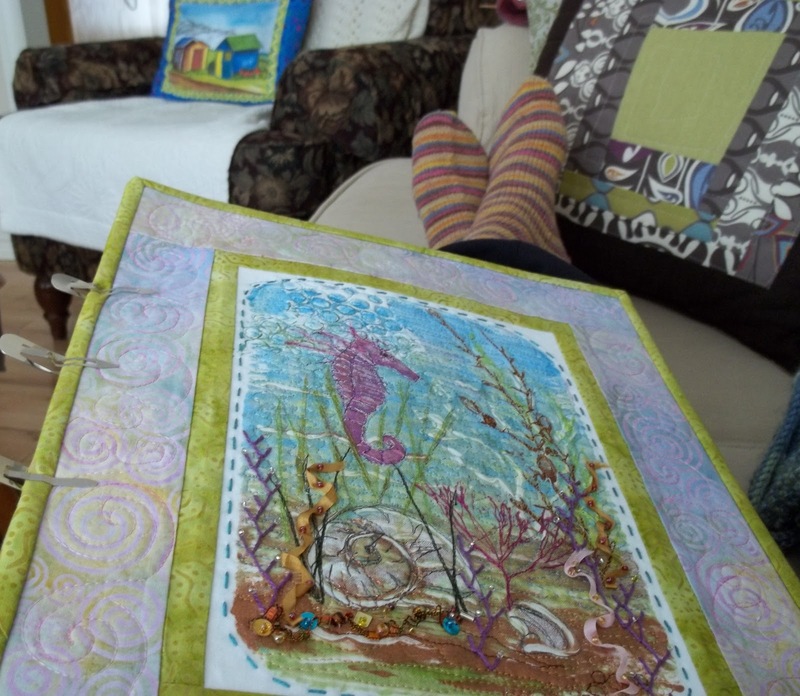 When I came in from my short walk today, I curled up to watch a quilting Arts DVD and then fell asleep. So, I'm trying to take it easy, do a little exercise each day and get my rest. When I can I will get back into it. So, I haven't forgotten, you, my readers. I am inhabiting a foggy lazy world at the moment. Hopefully, I'll emerge sometime. This a paper garland that I made in December while also trying to get ready for Christmas. I mailed it to my daughter in Korea in early December; she just got it this week. I made it with old book pages, scrap book papers, scissors and a punch, then I sewed it together with black free motion stitching. It was fun! Yesterday, it was the dentist and today it's a trip out of town to see an endocrinologist. 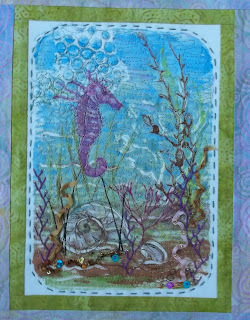 I've been doing little bits of things in my studio--finishing the binding on my little postcard and taking pictures for the cards I make, finishing up a border, ironing another quilt to drop off today to a machine quilter. I plan to pick up one more fabric for the final border on this. My husband has taken the day off to drive me so I will be able to do some knitting in the car. I love that. 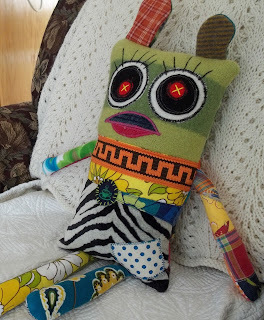 I packed a lunch, my hand quilting and went off to our guild UFO day today. It is held in the senior room of our local arena. Here you see a few of the ladies chatting and at work. It so fun to spend a few hours with a bunch of women doing what they love! 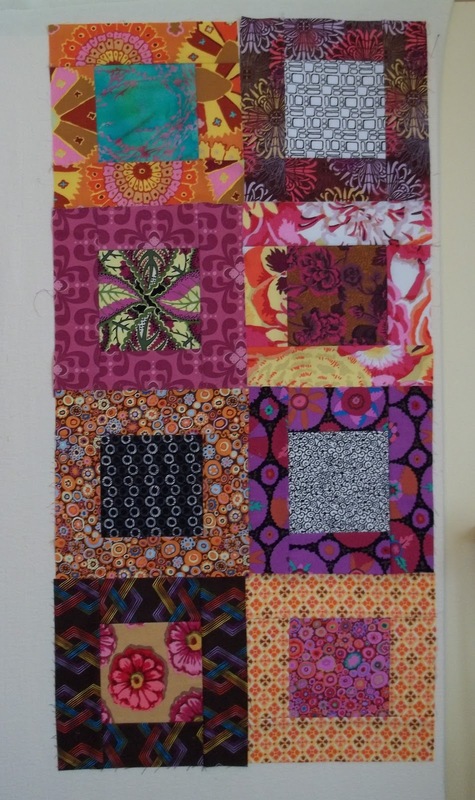 This is a stack and whack quilt that was admired by all. I don't think my camera really did the bright colors justice. 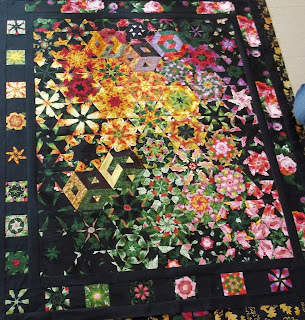 I took my quilt that I'm hand quilting so I won't show you that again. 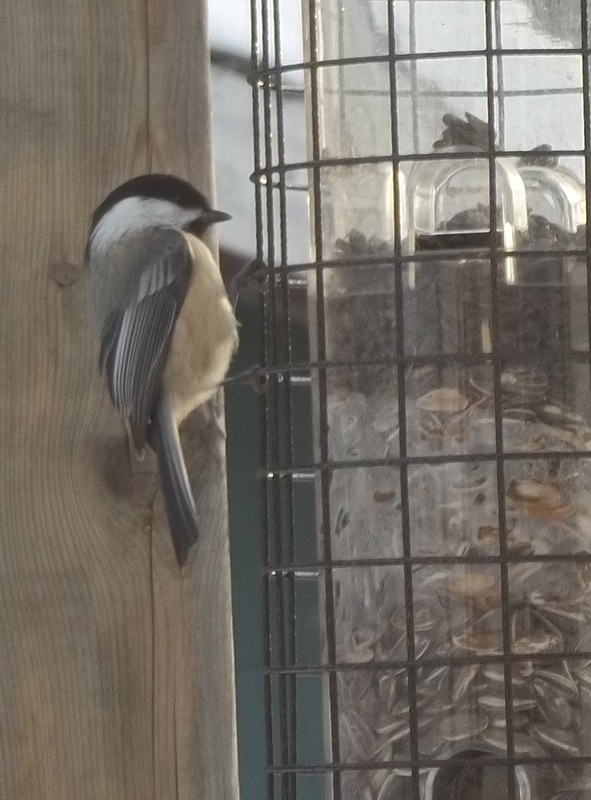 I've been trying every day to catch the little chickadees at my feeder, but they flit in and out so much that I keep getting an empty picture. I manage to catch the odd one. 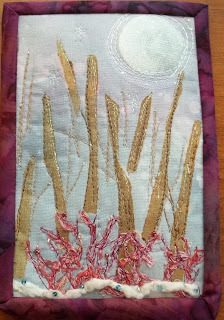 I'm just in the midst of hand sewing the binding on this postcard and it'll be finished. The only thing I added was a few tiny stars with the sparkly thread. If you look carefully, you can see them. although I haven't gotten around to starting an Etsy shop (someday) this is for sale if you email me if your interested. It's a wonder I get anything done with my indecisiveness! Between that and my battle with constant fatigue, I feel like I'm dragging all my little bits of fiber and fabric through several feet of water. This is just my way to explain why sometimes I can get things done and other times I feel very satisfied if I can just sew a few seams. As some of you may know, I am off from my usual full time job this year. My job now is to work on my health. I try to get at least 30 minutes of exercise daily and if it's sunny, I get outside. Sometimes I feel well enough to do some sewing and sometimes not. 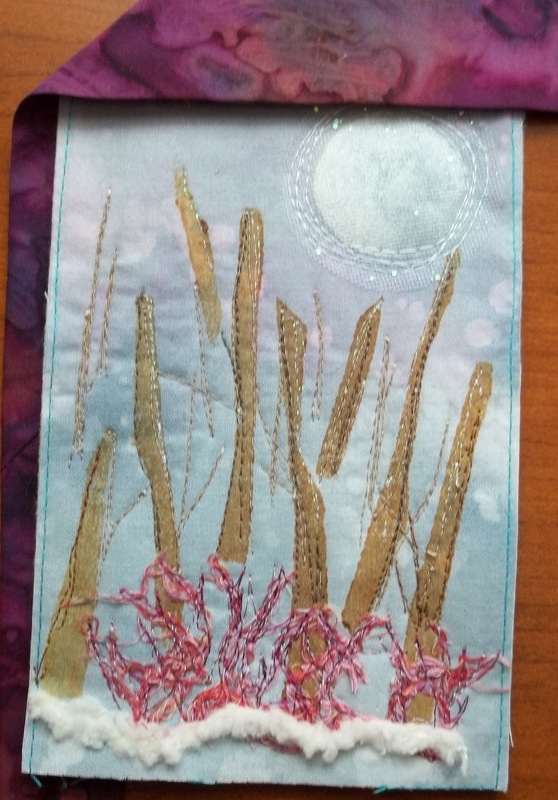 Today, I did a little free motion stitching on this postcard and cut the binding. 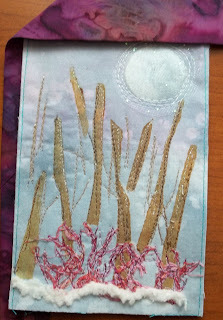 On and around the moon I stitched some tulle with sparkles. When I'm lucky, I know exactly when I'm finished. Other times, like now, I need to pause. I think it's done, but I'm not sure. It is after all just a little postcard. Does it need something? Yesterday, I worked on a series of my sketches that I want to send off to be made into Thermofax screens to use for printing. I thought I might get them scanned today, but I need to go take a snack break and then I will do some knitting. I've got stew meat simmering on the stove--my first red meat in months--and i must cut up the vegetables.